As the darkest and coldest part of the winter looms, the next three months or so are the most difficult to get through. There’s little to look forward to (the Super Bowl doesn’t quite do it for me) and spring seems so far away. This is when I remind myself that it’s stew and soup season. These hearty but often healthy dishes can be as comforting as a fire in a fireplace (which most of us don’t have in NYC) on a cold winter day. 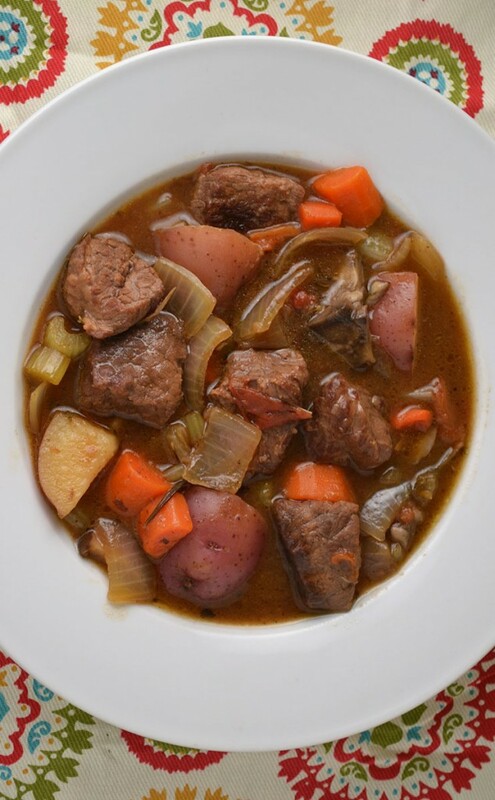 If this winter becomes anything like last years – and lets hope it doesn’t – stews and soups are like that forgiving friend that’s always there for you. The cook times can work around your schedule and often the longer a soup or stew sits, the better it tastes. An easy one pot meal that can be made in the slow cooker while you’re at work. Though it may not be the prettiest, this beef stew is a classic recipe that I adapted from my good old friend, “The James Beard Cookbook.” I also referred to a version by my grandmother, Paula Peck, in “The Art of Good Cooking.” Instead of just the standard, beef, potatoes, carrots, and onions – I also added mushrooms, tomatoes, and celery. Feel free to experiment with whichever vegetables you prefer. Since the beef needs to be cooked slowly to break down the fat and make it tender, I added each vegetable throughout the cooking process accordingly to my preferred doneness for each one. 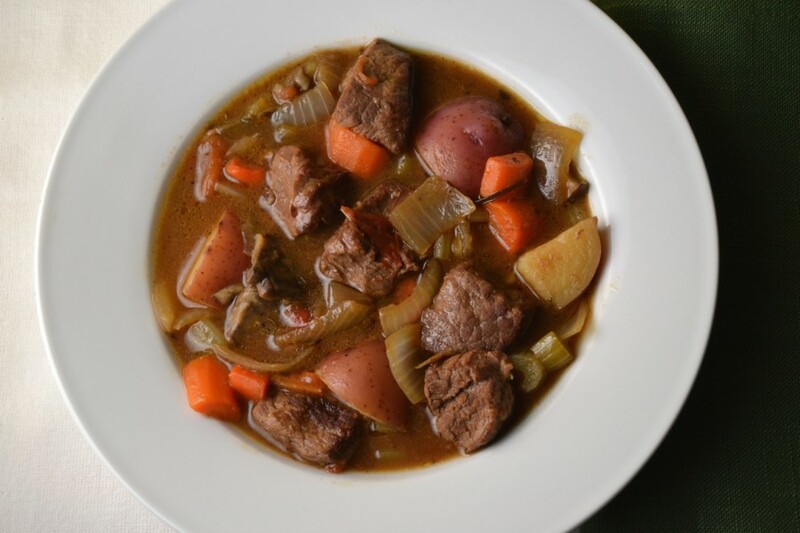 However, both the vegetables and beef could all easily be thrown together in a slow cooker. After just a few hours, the house smells of rich beef broth with scents of onion and thyme. Serve alone or over rice – the broth acts like a thick gravy that will be devoured with each steaming beefy bite. It may even make you forget about the long stretch of winter ahead, at least for the moment. Place flour in a shallow dish and add salt and pepper. Roll meat cubes in flour mixture. Melt butter in a large heavy soup pot or dutch oven over medium heat. Add garlic and beef cubes. Brown beef cubes on all sides. Add enough stock to fully cover meat. Bring to a boil then reduce to a simmer. Add the bay leaf. Simmer, degreasing occasionally, until beef is tender (1 ½-2 hours). Halfway through cooking (about 45 minutes), add the potatoes, carrots, celery, parsley, and thyme. Add the mushrooms and tomato about 15-20 minutes later. Remove the thyme stems and bay leaf. Serve hot in large bowls or with rice. James Beard’s little paperback cookbook was always my go-to cookbook (now lost). Everything seemed to be in there, and it was always reliable. Thanks for the recipe!